Harsh winters are a fact of life in the Northeast. Northern New Jersey saw more than 57 inches of snow during the 2013-2014 winter season, making it the eighth-snowiest winter in the last 120 years. When the snow starts to fall in earnest, we depend on snowplow crews to effectively and efficiently clear the roads. These snowplow operators are faced with the challenge of making the roads safe for drivers, often during or directly after the worst of the snowfall. But although the job is difficult, snowplow operators have a legal—and moral—obligation to plow the roads safely and not cause harm. If you or a loved one have been seriously injured in a snowplow accident, contact Maggiano, DiGirolamo & Lizzi. Our experienced personal injury lawyers have more than 80 years’ worth of experience fighting for the injured in New Jersey, and we have the skills and resources to see your case through to the very end. Call (201) 585-9111 or contact us online to speak with one of our experienced personal injury attorneys today. An experienced personal injury lawyer will be able to conduct a thorough investigation to determine the true cause of the collision. Using vehicle evidence, police reports, medical reports, and witness statements, an attorney can reconstruct the scene of the accident and work to determine the proximate cause of the accident. After a serious accident, it is crucial to see a medical professional right away. Some injuries can take hours, days, or even months to realize; for example, the effects of whiplash or a concussion may not be apparent right after the collision. As such, it is important to consult a doctor immediately following the accident to ensure there are no internal injuries or underlying problems that need to be treated. In addition, if your accident was the result of the snowplow operator’s negligence, seeing a doctor right away can help your case. Visiting the doctor right after an accident will show that your injuries were serious enough to necessitate immediate medical attention. On the flip side, not seeing a doctor until days or weeks later can be used against you by an opposing attorney, who will argue that you would have visited the doctor sooner if you were “truly” hurt. However, snowplow accidents often involve a different set of stakeholders than a regular car accident. Snowplows can be owned and operated by private contractors, municipalities (i.e. cities and towns), or the state Department of Transportation. A snowplow accident that takes place on the highway will likely involve a different set of players than one that takes place in a mall parking lot. A personal injury attorney can help you determine who owned the snowplow in question and identify the responsible party (or parties). It is important to note that, if the snowplow was operated by a local or state government agency, there are special rules to follow. The statute of limitations in New Jersey for a normal personal injury case is two years, meaning you have two years from the date of the accident to file your claim. However, if you wish to file a lawsuit against a government agency, you must give formal notice of your claim within 90 days of the accident. After filing the initial notice, you must wait six months to file a lawsuit. During this time, the agency will most likely reach out to you to resolve your claim; with the help of an experienced attorney, you can decide whether to resolve your claim with the city or file a personal injury lawsuit. 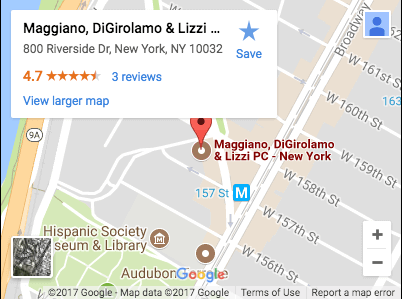 If you have been injured in an accident involving a snowplow, Maggiano, DiGirolamo & Lizzi is here to help you recover your losses. With more than 80 years’ worth of experience fighting for the injured in New Jersey and New York, we have the resources and experience to fight for you. We have collected more than $300 million for our clients over the years, and we are committed to pursuing justice in your case. We will conduct a thorough investigation of the accident, using our resources to interview witnesses, collect police reports, and obtain medical evidence. Our years of experience have given us the tools and resources to stand up to municipalities and their legal teams, giving you the best chance of a successful outcome. If you or a loved one has suffered serious injury as a result of a snowplow accident, contact us today for a free consultation. Call (201) 585-9111 or contact us online to speak with one of our experienced car accident lawyers.